It's tempting to head to the pool when your only symptom of sickness is a sore throat. A sore throat doesn't always affect your performance and therefore your ability to enjoy a swim at the pool. Still, just because your sore throat doesn't seem to affect you heavily, it could affect other patrons. Not only does swimming while sick spread germs and bacteria, but it could make your sore throat worse with sensitivity to the chemicals used in the pool. The general rule thumb when you're sick is that if the symptoms are above the neck, you're fine to continue, albeit at a lesser pace. That means a sore throat, runny nose or cough are typically fine. Below-the-neck symptoms such as nausea, stomach cramps and chest congestion require rest. Still, your symptoms as a whole are a better indication of whether you should swim. Congestion or a runny nose is fine, but a sore throat with aches and a high fever is contagious and might require medical attention. When your sore throat isn't the result of a cold or other illness and occurs during or after your swim, you could be having an allergic reaction to chlorine. Chlorine allergy and asthma is a condition in which the concentration of pool chemicals triggers both allergy and asthma symptoms, including wheezing, constricted breathing, sneezing and sore throat. Chlorine-triggered asthma and allergies are more common in people that have already been diagnosed with asthma. 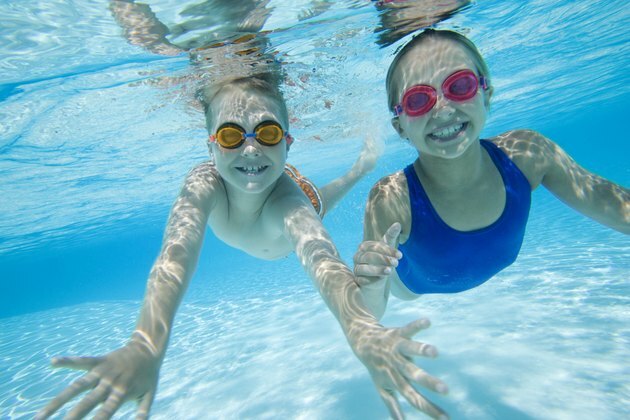 When you swim in public pools and recreational water, you run the risk of contracting certain water-borne illnesses or recreational water illnesses or RWIs. One type of RWI is specifically limited to natural freshwater and saltwater sources where blue and green algae is present. Sometimes called cyanobacteria, contact with the algae result in nausea, diarrhea, sore throat, fever, headache, cramps and joint pain. When you're already sick with a sore throat, especially one with a fever or aches, it's always best to stay home to avoid contaminating the water and spreading bacteria. If your sore throat occurs during or after swimming, it's likely the water causing the pain. If you're allergic or asthmatic, swimming in an well-ventilated or outdoor pool helps to disperse chemicals to avoid reactions. If your sore throat is the result of swimming in outdoor, unmaintained body of water, see your doctor for examination and avoid swimming in bodies of water near or containing visible algae.